The Raising Of The Maibaum! A Little Slice Of Bavaria. Do you like a party where your whole community comes together to celebrate a special day of the year? Where your entire village works hard to maintain traditions to be passed to future generations? A party where you dress in traditional clothing, enjoy tasty regional foods and spend a wonderful Spring day getting to know your neighbors again after the long winter. Well, I sure do! 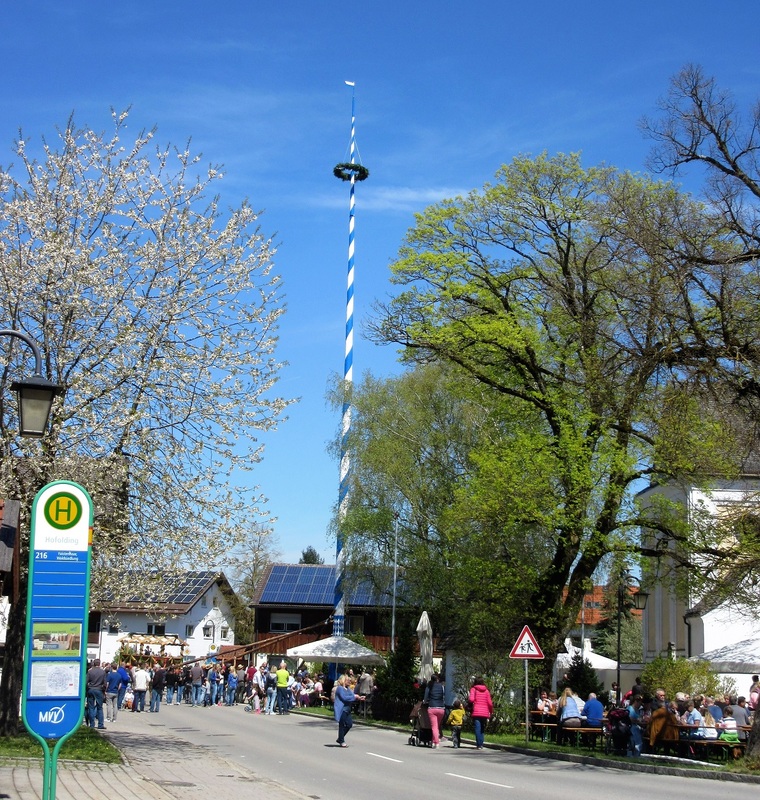 In Bavaria, that party is putting up the Maypole or “Maibaum.” A tradition that goes back to the 13th Century. These days, the Maibaum celebrates the symbolic working wealth of a community. Let’s take a look. 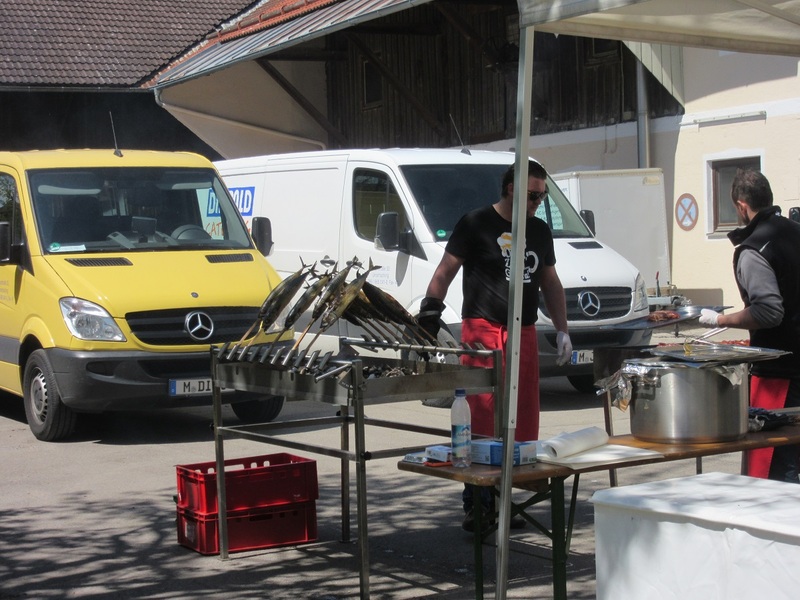 Many Bavarian villages, towns and cities have a “Burschenverein” club which is similar to a young farmers club. Every 3 to 4 years, depending on your community, these young men head out into the woods to choose an enormous tall pine tree up to 20 meters high that is chopped down and then hidden. “Hidden,” you say? 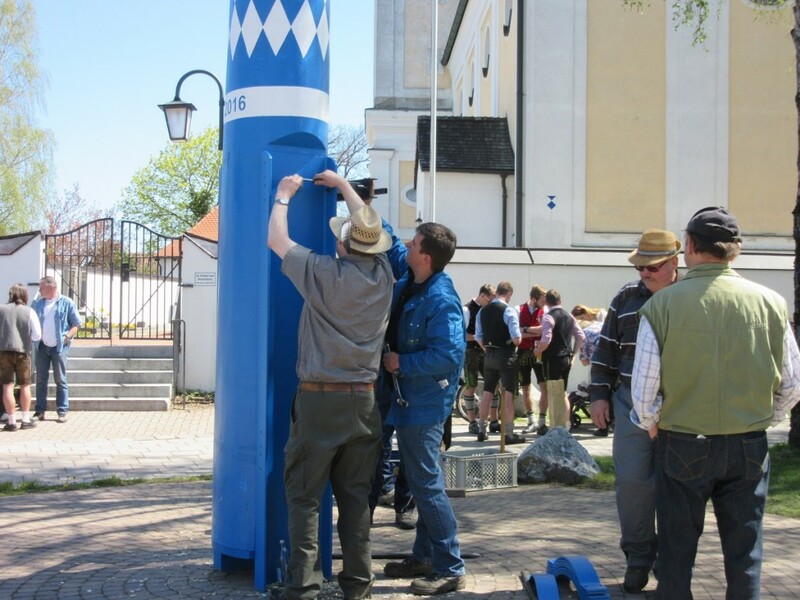 Yes indeedy do, it is hidden and closely guarded 24 hours a day to ensure that members of other Burschenverein in the playful spirit of the game do not find your Maypole and steal it! This game involves prodigious amounts of food and beer and lasts for several weeks before May Day arrives. 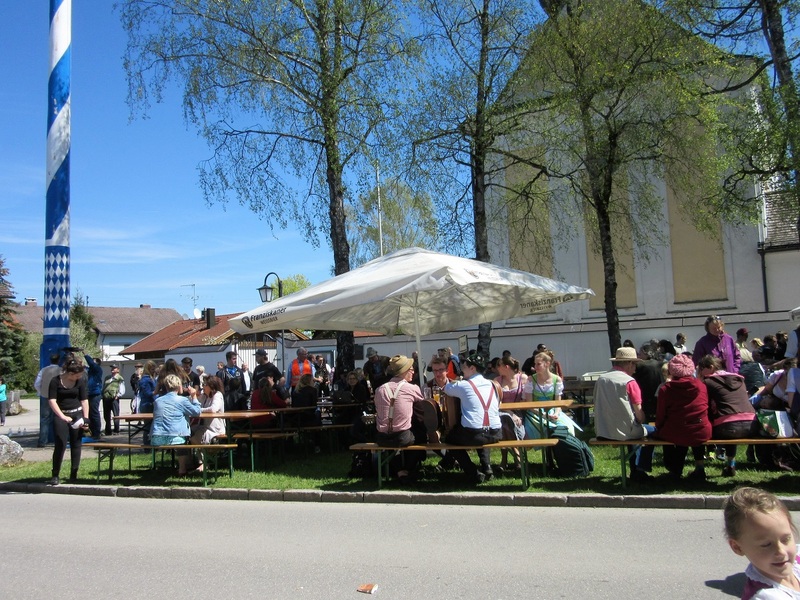 If one village should manage to steal another villages Maibaum, there are extensive negotiations involving even more food, laughter and beer that take place in order for the Maibaum to be returned. Ahhh……, but there are rules to this game and the stolen Maibaum is never, ever, ever to be damaged in any way. It truly is all in good fun. So how did we get involved in this one? Dan was driving home from one of his trips and just happened to see something that looked a little strange. Hidden behind a hedge, between a shed and a barn was a curious tarp covering something that was not there before. When he told me about it, I had to see for myself if this was truly a Maibaum in hiding. And it was! Not being bashful, I asked Sparky to pull over on the side of the road and I got out to take a photogragh through the hedge. I was instantly spotted and had to throw up my hands and playfully ask them not to shoot me. I believe my actual words were, “I’m an American, not a spy, don’t shoot!” I was immediately invited to the party and offered a beer, which I politely declined. The raw Maibaum under cover in he village of Holfolding. 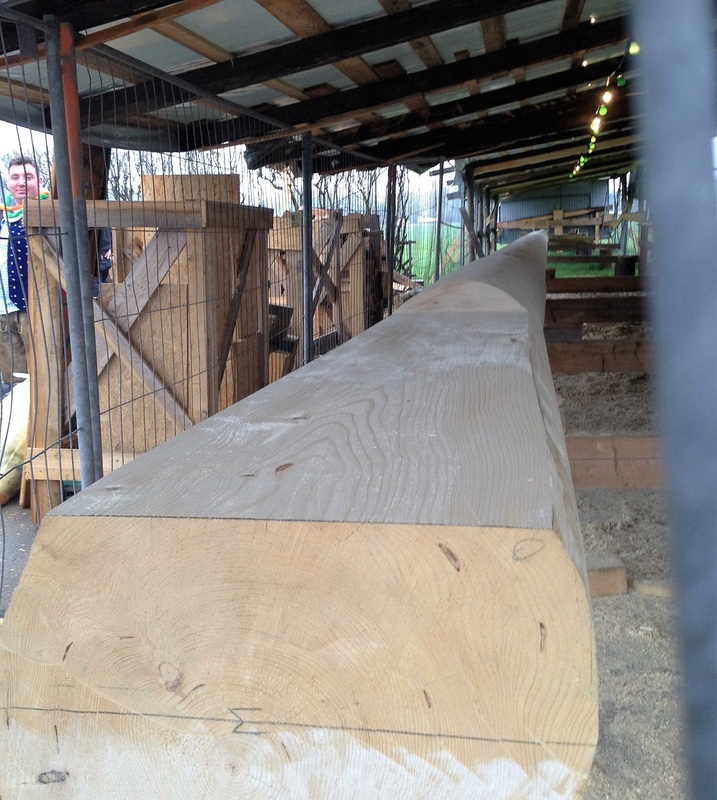 The men of Holfoldng proudly showed me the hidden pole which was peeled and planed in preparation for painting. The bottom end is squared or made rectangular to fit into the metal standard. My new friend at 9 am on a rainy day, faithfully fulfilling his duty to party and protect the Maibaum. 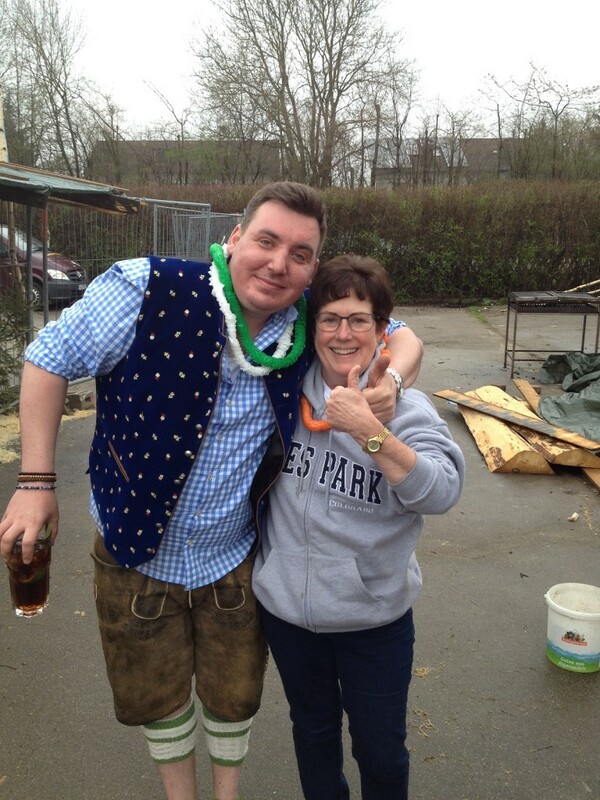 He even gave me a Lei which I don’t think is a typical Bavarian decoration. Ha Ha. And then……… the 1st of May arrives and it’s time to raise the Maybaum! Using multiple log poles grouped together with ropes, the Maypole is slowly lifted into place using the muscle of the young men from the village. Set firmly into the large metal base it is safely secured because if thing ever falls, there could be disastrous results! Note handsome young men in Lederhosen! 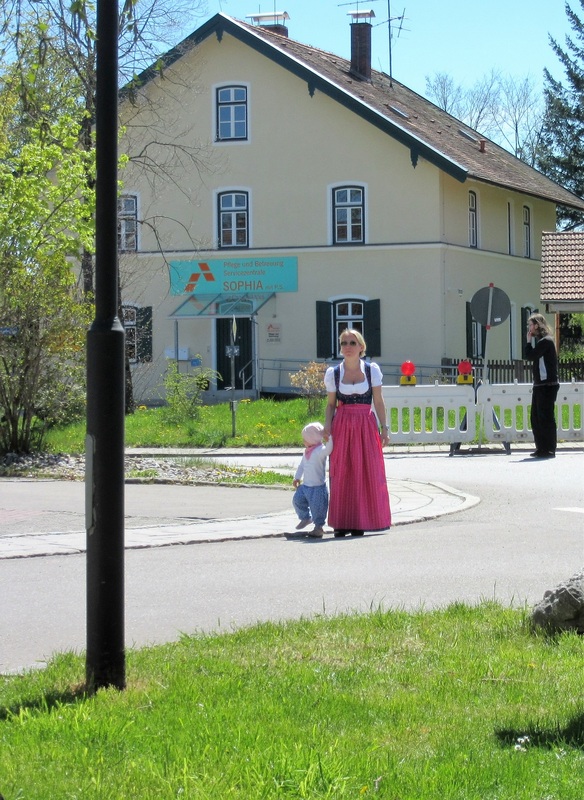 The village young people wearing traditional Bavarian dress in front of the logs used to raise the Maibaum. And then……it’s time to relax, eat, drink and be merry! The center table has guys with musical instruments playing German music. And they were good! These 2 darling little free spirits dancing and laughing their hearts out! 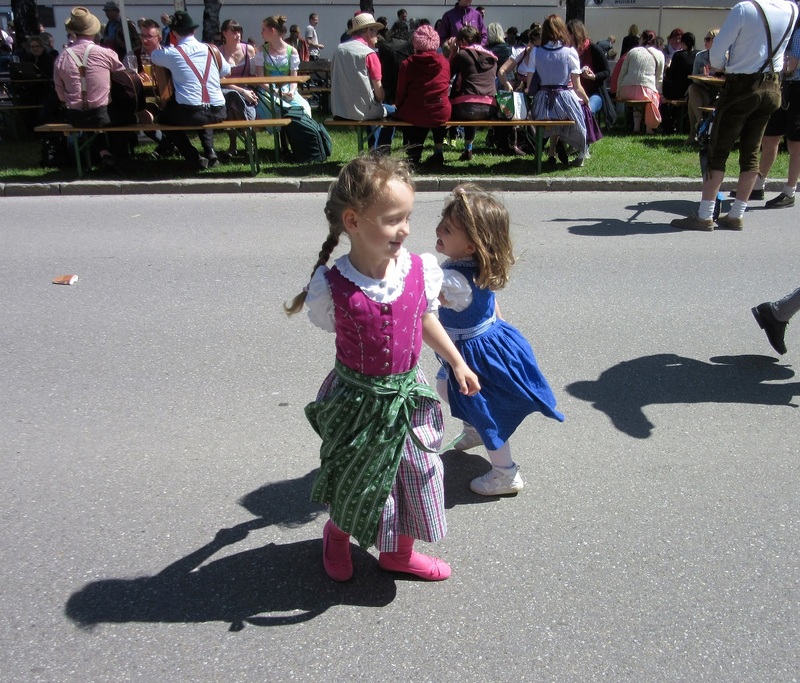 The little ones wearing their Dirndl’s is just the picture of sweetness. Can’t have a party without food and Steckelfish ( fish on a stick, usually Mackerel)are smoked over open flame at every occasion. Not my cup of tea, but the Bavarians love them. Village volunteers man the food tent. 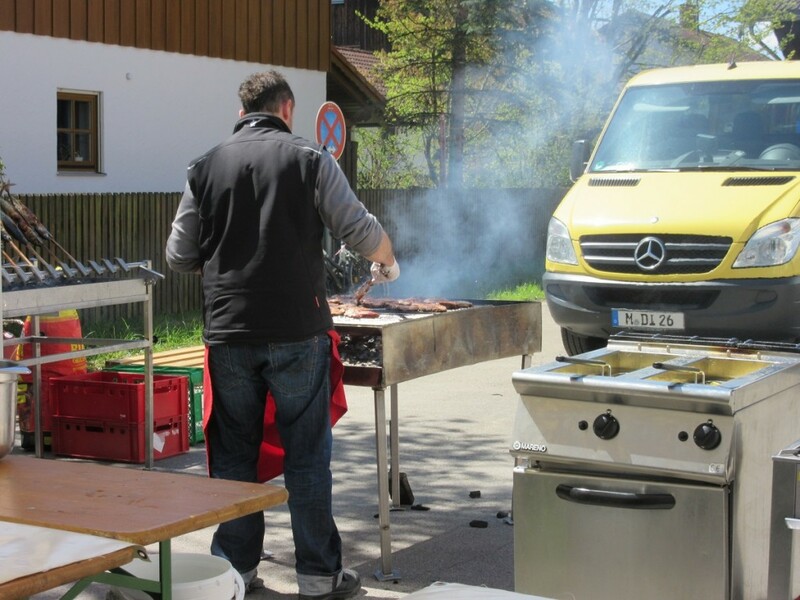 They had Sausages, Leberkasse Semmel and marinated Pork Steaks on hard roll. Pretty typical street fair food and all delicious! 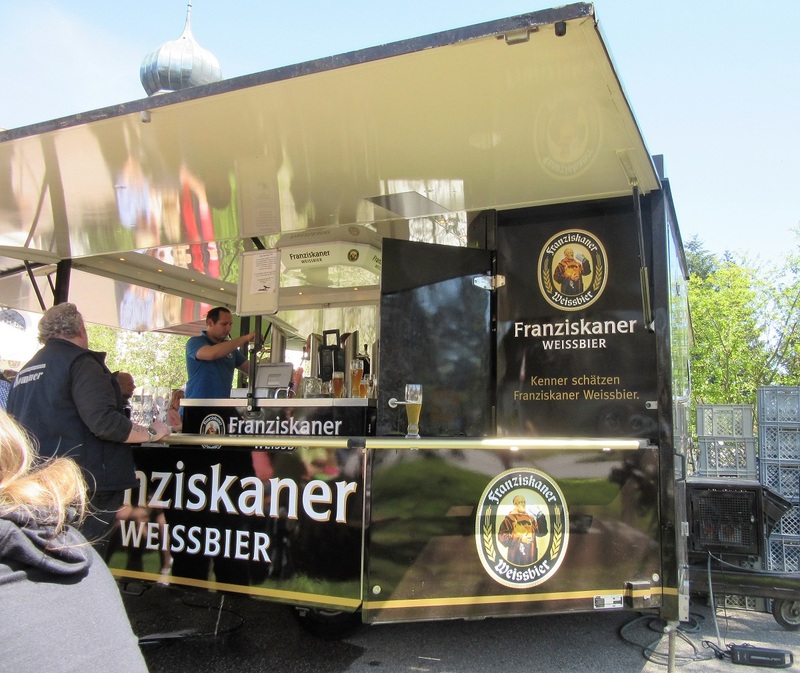 Sparky continuing his quest to sample beer across Bavaria! That, and his Leberkasse Semmel which he loves. Finally, the perfect warm, sunny day for an outdoor celebration and for me to chow down on a Pork Steak sandwich. 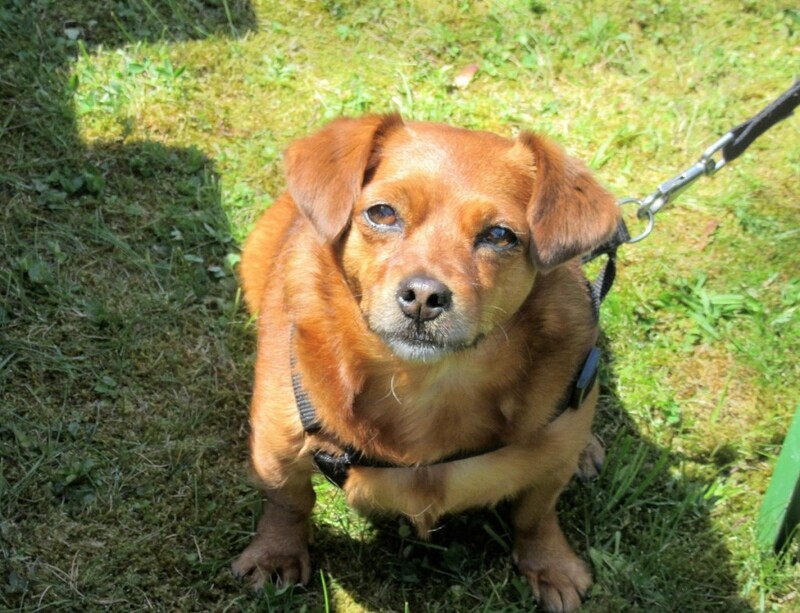 Come on…..it’s Germany! There is no party unless the portable Beer Wagon is on site! There is always a line at the beer wagon. 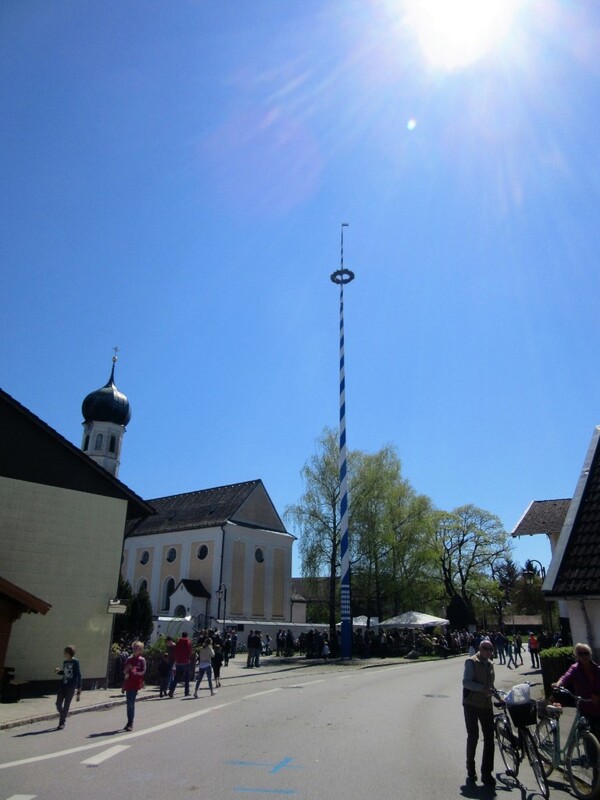 And the beautiful Bavarian Blue Maibaum is up and in place for 2016! The party, music and dancing will continue well into the evening as a community celebrates itself and their traditions! In the days ahead, the iron designs representing the services or “wealths” of the village will be added. 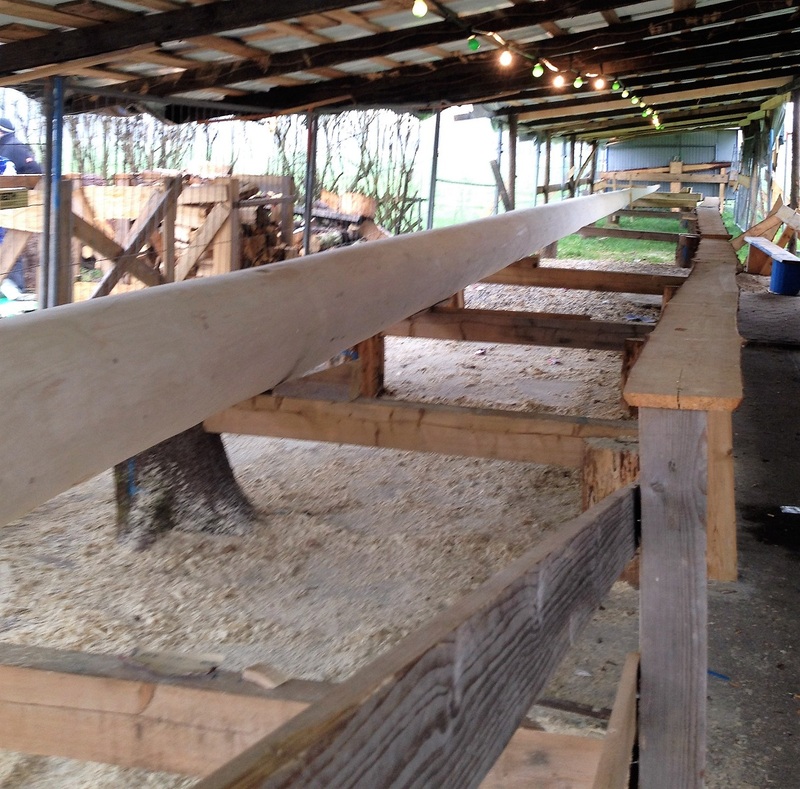 There will be signs for a baker, carpenter, black smith, tailor,farrier etc., all hung proudly on the Maibaum. Thanks for stopping by today and letting me share another little bit of Bavaria with you. 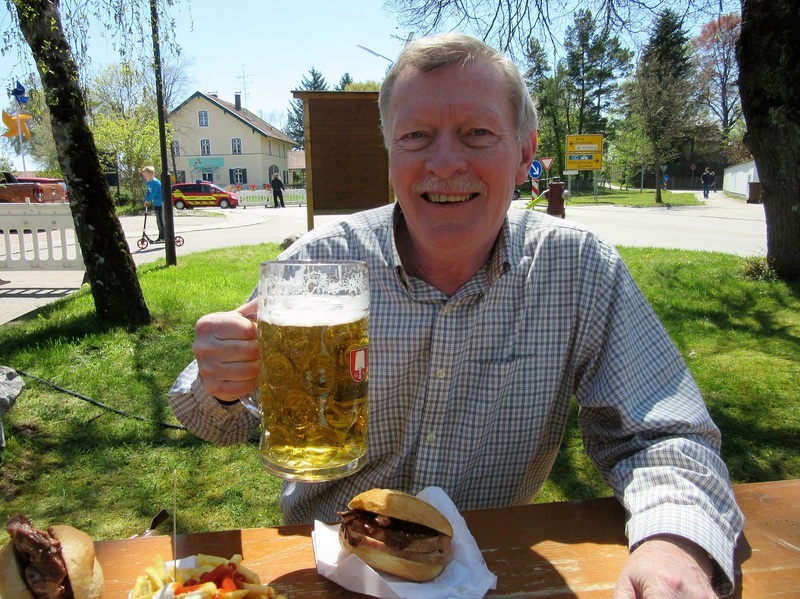 I hope you enjoy it as much as I enjoy sharing my Bavarian life with you, my friends. Wherever your journey leads you today, I wish you the joy of friendship and community spirit. Please leave ma a comment. I love hearing from you all! How luck you were to be able to see it being crafted! What a wonderful tradition and a beautiful day for the festival! This was indeed Maibaum year and many, many villages put up their Maibaums! It was just such a fun experience! Yes, we were lucky. The Bavarian people are a fun and family loving people. It has been a pleasure to live amongst them. Thanks for writing! I think this “may” be my favorite too! This is a wonderful celebration! Love the Maypole story and the fun in trying to steal it. 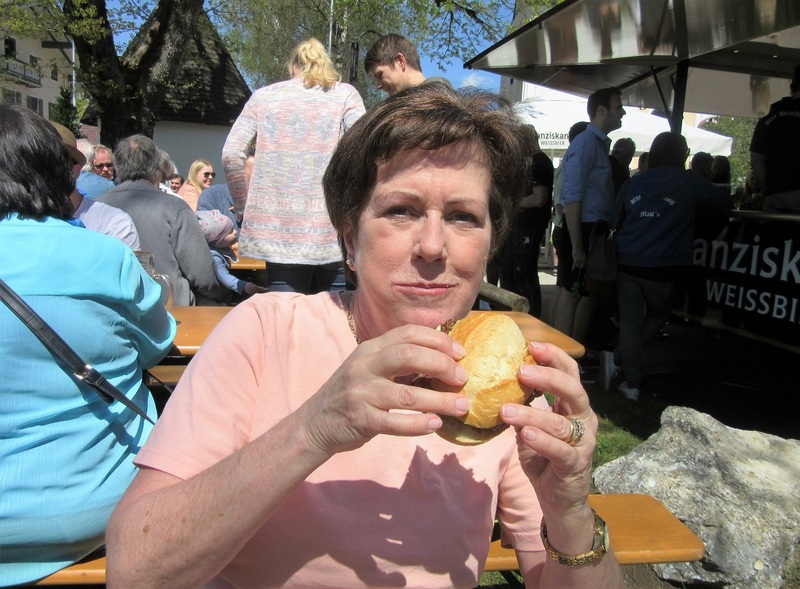 The Bavarians are a fun loving people who value tradition and enjoy life! Thanks for commenting. What a nice story! Love your photos of people and places! Thanks for commenting. I truly appreciate your support! Another great post (all of them are). I never knew the story behind the Maypole (I led a sheltered life when it came to traditions-only Sicilian). Love the pictures. Thanks for sharing. Half the fun of living in Europe is getting acquainted with the traditions and cultures of all the different countries. It sure has been fun! I am glad you enjoyed the post and thanks for writing!